We’re back with another racing game, and it’s Drag Racing Classic, an iOS-only title from Osauhing Creative Mobile. The game developer claims that its title is the most addictive, nitro fueled racing game for the iPhone and iPad. 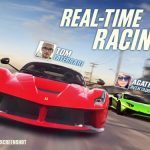 You can drive more than 50 real-life cars, including high-powered supercars and muscle cars from BMW, Dodge, Ford, McLaren, Pagani, and the 1,200-horsepower Hennessey Venom GT. You can race other real-life players one-on-one, or in ten-player races in the Pro League. You can take part in quarter-mile or half-mile races, and also tune your car to make it the most formidable competitor in the drag races. 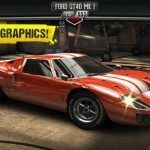 This is quite an in-depth racing game, with a particular focus on the multiplayer experience, which sets it aside from similar titles like CSR Racing and CSR Classics that boast of a rich single-player gaming experience. So if you want to win more races and beat more opponents, we suggest you read our compilation of Drag Racing Classic cheats, tips and tricks. Like many other racing games of this type, a lot of your success depends on how well you start. Focus on the light in the middle of your screen; get ready for the light turning green, and make sure you’re revving in the green zone so you can get off to a flying start. Take note that faster cars have smaller green zones, thus making it harder for you to get a perfect start on cars like the aforementioned Hennessey Venom GT. 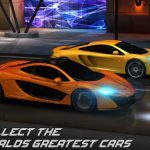 While multiplayer is put at a premium in this game, you should also take part in the quick races. This is a fantastic way for you to farm for extra cash that you can then use to upgrade your ride. 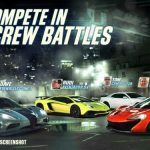 Upgrades get more expensive as you go along, so keep on racing – and winning – those quick races, as you can win better in-game cash rewards with a more powerful car. Buying upgrades for your car’s parts is one thing, but you can also tune your car by changing the gear ratio. Don’t pay much attention to this as this won’t really make much of an impact at first; use the presets for quarter-mile and half-mile races to save some time. But as you advance and get Level 5 or Level 6 cars, you’ll find yourself needing to make the adjustments yourself. Cars such as the Venom GT (yes, that car again) and the SSC Tuatara are especially prone to wheel spin that could compromise your race times, making them especially important to tune once you’re able to race them. Feel free to test your tweaks out in the quick races before testing them out against real opponents. Of course, you will start out with a cheaper, less powerful car, but you will eventually have to move up and buy something better and more powerful. Only upgrade these cheaper cars when absolutely necessary, but don’t upgrade them to the nines, because you won’t be using them for long.